Add a bit of classic elegance to everything you wear from jeans to your finest evening wear. This cluster pearl necklace is so versatile. Wear it alone, add a pendant or layer it with other chains and necklaces for a different look every day. 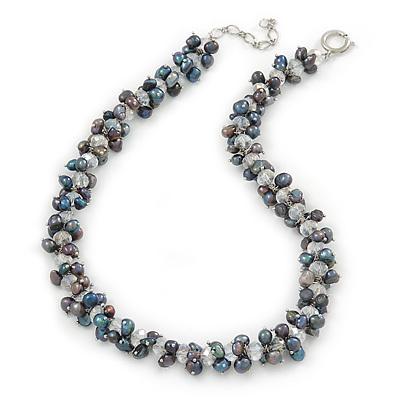 Featuring a cluster bead design, made of 7-8mm peacock coloured Baroque freshwater pearls alternate with transparent, faceted crystals beads. The necklace has about 42cm L with a 4cm Ext. Fastens with a silver tone spring ring clasp for a reliable fit.